A simple tool to help finish felted pieces. 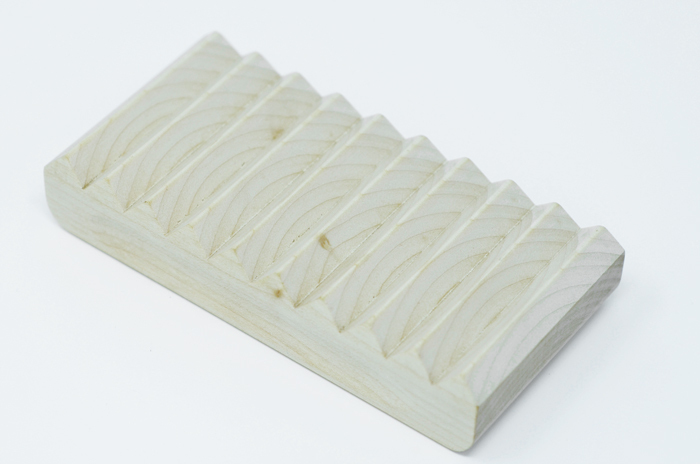 The fulling block is used in the later stages of felting to get a harder surface finish on the felt after the initial felting of the fibres has taken place. Working the ridged surface of the block across the wool speeds up the process. It can also reduce the effort required as very little pressure is needed, the ridges do the work. The block is extremely useful when making cords or beads as a good hard finished felt is needed for both these products. Made from European Maple. This is a good close grained wood resistant to being wet, with some woods the grain can raise and become "hairy". Maple avoids this problem.